LAGUNA BEACH – In a quarter-acre lot tucked into Laguna Canyon, Erik Cutter is feeding his neighbors food he says is fresher, healthier and safer than anything else available in Southern California. Alegria Fresh is the first hydroponic, vertical farm on the West Coast, and Cutter is hoping to become a model for high-yield, resource-efficient growing. The farm – 150 7-foot-tall towers that hold more than 8,000 plants – produces everything from arugula to zucchini, and in only 1,200 square feet. Each plant grows in reusable coconut fiber instead of soil, and each pot is linked to an automatic watering system. The result is about 90 percent less water used and 10 times more food yielded than a conventional farm. Numbers aside, Cutter is confident the flavor of his produce is better than what's available on a grocery store shelf. Each potential customer who walks into the tiny farm comes out with a free bouquet of greens, herbs and vegetables to see what he's talking about. "We put our lettuce where our mouth is," he said. The 55-year-old Laguna Beach resident grew up eating fresh fruits and vegetables, and he'd always had an interest in nutrition and wellness. In college, he studied biochemistry with plans to become a doctor. "I abandoned medical school because I didn't believe in pharmaceuticals," he said. "They weren't into health care. They were into making money." Cutter describes his career path as that of a serial entrepreneur, working on everything from automotive design to marketing. For 15 years, he published Baja Life magazine, and in 2009 he founded EnviroIngenuity to bring more sustainable technology to businesses. Alegria Fresh is that company's latest venture. With $100,000 and 10 weeks, Cutter and three others built up the farm from a vacant lot. He hopes to spread the word on how simple setting up a vibrant growing operation in a small space can be. "We should have one of these every three to five miles," he said. The towers allow a farm to pop up in virtually any size space, and the hydroponics help ensure quality. With no soil, soil-borne diseases and toxins are out of the picture. Plants are fed automatically with a nutrient-rich solution that can be adjusted to improve health and sweetness. "Hydroponics gives me the ability to feed the plant the right nutrients at the right time," he said. Cutter doesn't grow marijuana – he jokes the farm would be much more lucrative if he did – but he views his herbs and vegetables as medicinal. He calls the operation a "farmacy," pointing out plants that he said can reduce anxiety or prevent cancer. "I'm a very big believer that food is medicine," he said. The power of food, however, diminishes greatly in the time it takes to travel from farm to table, he said. Alegria Fresh aims to get its produce into customers' hands within two hours of harvest. After harvesting, drivers on a produce route deliver vegetable bouquets to subscribers' homes, starting at $20 each week. Each bouquet can be made into about five salads. Laguna Beach resident Molly Shipp, 38, became the first subscriber after a visit to the farm. "I was shocked," she said. "Why isn't anyone else doing this? It makes total sense." Ultimately, the convenience of getting healthy food delivered is what appealed most to the busy mom. The farm delivers items she might never have picked up at the store, and tossing together a tasty salad is simple. "You don't even have to think about it," she said. "You just throw it all in there and eat it." Another customer, Laguna Beach resident Cody Oakland, also said he was shocked the first time he saw the farm. "I felt as if I had walked into some kind of food fantasy," he said. For him, the promise of higher-quality vegetables grown without chemicals was the draw. "It's in line with what I believe food should be," he said. In Orange County, 10 certified farmers markets bring fresh fruit and vegetables to residents. Most of that produce, however, comes from outside Orange County, Assistant Agricultural Commissioner Mike Bennette said. "Apart from avocado and strawberries, we really don't have a whole lot here," he said. Though agriculture was once a dominant industry in Orange County, most nurseries and farms have been transformed into housing. "We either see the little backyard type of growers, or we have four or five conventional, medium to large growers," Bennette said. Cutter is hoping Alegria Fresh sparks a local growing renaissance. Though his is the first hydroponic vertical system in the area, the model has found success in other parts of the country and the globe. Tim Carpenter, owner of Florida-based Verti-Gro, created the system used at Alegria Fresh in 1996. It's on display at Epcot's Living with the Land display. In addition to farmers around the Southeast, he's sold to more than 40 countries. The company has factories in Colorado, Mississippi, Puerto Rico, Dubai, France and South Africa. "We're just saving space, water and energy," said Carpenter, who has worked with hydroponics and greenhouses since the '60s. "That's got to be the way of the future." 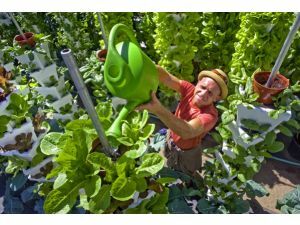 Erik Strickland of Laguna Niguel waters one of the growing towers that holds 60 plants of red and green Romaine lettuce at Alegria Farm in Laguna Canyon which grows more than 7,000 plants on 1/4 acre of land. The vertical, hydroponic farm aims to reinvent farming by taking up less space and using fewer pesticides. Click here to view more photos.